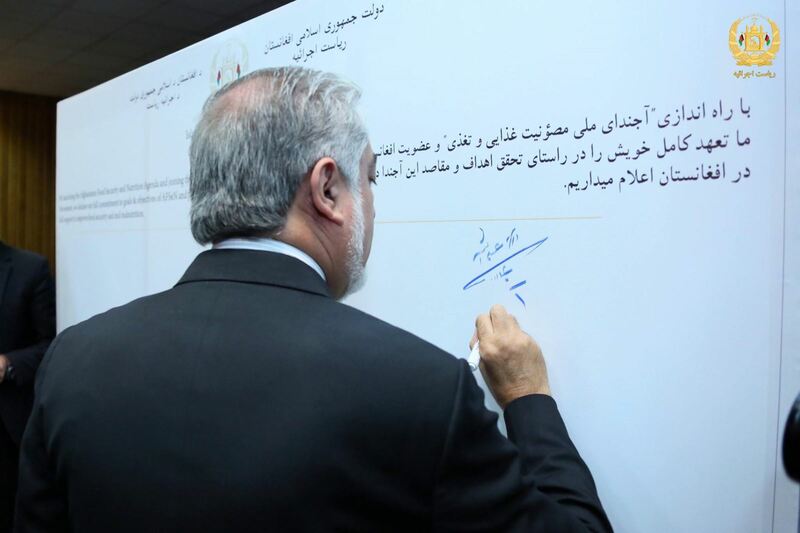 Dr. Abdullah Abdullah, Chief Executive of the Islamic Republic of Afghanistan, in a ceremony marking the World Food Day and launching of the Afghanistan Food Security and Nutrition Agenda (AFSeN), said Afghanistan's membership as the sixtieth country to receive the membership of the Scaling Up Nutrition Movement is an important step to solve the challenges. In the program that was held today at the initiative of the head of the secretariat of the Council of Ministers of the Chief Executive, a number of cabinet members, MPs, representatives from UN and foreign countries, international organizations, private sector and civil society activists were participated. “41% of children under the age of five in Afghanistan suffer from malnutrition and the availability of adequate food is still a serious challenge in the country," said the Chief Executive, who spoke on the occasion of the World Food Day. Dr. Abdullah added: "The statistics shown on those who do not have access to the proper food is shocking. The Chief Executive, while calling polio eradication program effective, emphasized on the need for support and cooperation of the international community and the donor countries in this regard. Dr. Abdullah warned that if we do not understand these challenges and do not take preventive measures, negative consequences and the harm they cause will put the health of society at risk, which ultimately causes social instability. "The membership of Afghanistan as the world's 60th country in the Scaling Up Nutrition Movement is an important step towards solving the challenges," the Chief Executive emphasized on necessary measures to provide citizens with food security. Dr. Abdullah noted that in the past, we had policies, we had methods, we worked on different strategies at different times, but the need for their coherence was felt and understood. The Chief Executive said Afghanistan Food Security and Nutrition Agenda (AFSeN) was developed to coordinate and cooperate with the Afghan government and the international community to work harder on promoting the status quo. Dr. Abdullah stated: "Improving livelihoods and providing people with adequate food is one of the obligations of the National Unity Government which should be pursued in a long-term plan." In this program, Ministers of Health, Agriculture, Ms. Gerda Verburg, Assistant United Nations Secretary-General and Scaling Up Nutrition (SUN) Movement Coordinator, UN representatives and other international organizations as well as representatives from foreign countries also spoke on the subject. They said that lack of proper food is one of the main causes of diseases in the country. At the end of the meeting, government agencies and representatives from countries and organizations backed AFSeN and the discussion on the causes and consequences of malnutrition, lack of citizens' access to appropriate food and the necessary solutions were fully discussed. Meanwhile, the committee on malnutrition and food security was to be held regularly under the presidency of the Chief Executive with the participation of 10 Ministries and representatives from international organizations and foreign countries.